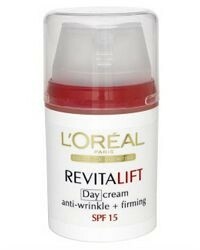 L’Oreal Revitalift Anti- Wrinkle and Firming SPF15 Day Cream has been developed to reduce the appearance of wrinkles and make skin feel firmer. The luxurious and light textured formula is quickly absorbed without leaving any sticky residue and is ideal as a base under make up. L’Oreal Revitalift Anti- Wrinkle and Firming SPF15 Day Cream has been formulated with an SPF15 to protect against the harmful effects of the sun and pro-retinol A and fibre-elastyl to reduce the appearance of exising wrinkles. Active Ingredients: Ensulizole 1.8%, Octinoxate 7.5%. Inactive Ingredients: Water, Cyclohexasiloxane, Glycerin, Triethanolamine, Ammonium Polyacryloyldimethyl Taurate, Polysilicone-8, Silica, Caprylic/Capric Triglyceride, Acetyl Trifluoromethylphenyl Valylgycine, Retinyl Palmitate, Sodium Hydroxide, Polycaprolactone, Biosaccharide Gum-1, Crithmum Maritimum Extract, Phenoxyethanol, Imidazolidinyl Urea, Sodium Methylparaben, Chlorphenesin, Methylparaben, Fragrance, Linalool, Benzyl Salicylate, Citronellol, Alpha-Isomethyl Ionone, Geraniol, Limonene, Coumarin, Hydroxyisohexyl 3-Cyclohexene Carboxaldehyde, Butylphenyl Methylpropional, Citral.